平仮名 (ひらがな, hiragana): あ (i.e. "a"). 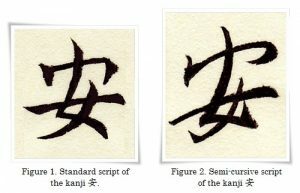 The modern form of the hiragana character あ comes from the cursive form of the kanji 安 (あん, an, i.e. “relaxed”, “cheap”, or “peaceful”).